Most synths come with a good selection of presets, but one of the big joys of electronic music making is being able to edit these sounds or, once you're feeling a bit more confident, build your own from the ground up. You'll get a long way simply by experimenting, but here are five tips from our friends at Cakewalk that should help any budding sound designer to master their craft. For the best results when editing and creating synth patches, you have to know what direction you want to go in. Are you looking to create a pad, or a staccato bass? Knowing the strengths of different types of waves will help you accomplish your task much more easily. For example, sine waves are excellent at providing a strong pitch foundation for basses and other instruments. Saw waves help a tone cut through due to their buzziness. Square waves lie somewhere in the middle, and can be used to emulate flutes and other smoother tones. Starting with basic knowledge of all the wave-essentials will give you an enormous advantage in knowing how to begin crafting your sound. If you have multiple oscillators, don't be afraid to use them. To learn what they all do, start experimenting by duplicating the first oscillator's settings to the second, then adjust the second. Try detuning it slightly to thicken up a sound, or dropping it down a full octave or two to add a low end reinforcement. Start adjusting any available per-oscillator effects or filters such as bit reduction, drive, or warp. When you start combining different waves you can create some interesting textures and convincing emulations of other instruments. Use the available layers to your advantage! There are a number of ways you can adjust the timing and playback of your sounds. By adjusting the envelope, you can control how slowly or quickly the sound will play after a key is struck, or how long it will ring out after the key is released. This can help make a sound more percussive or more flowing like a bowed instrument. In addition, Low Frequency Oscillators (LFOs) can be used to add rhythmic interest to your sounds. They can be synced to the tempo of a song to create a rhythmic pulse, and that pulse can often be routed to control any number of elements: volume, pan, filters, and possibly many more depending on the instrument used. There are a lot of possibilities with experimentation. If you've got a particular expansion pack or group of presets that you enjoy, have a look under the hood. Be sure to examine not only the oscillators, filters, and envelope, but also any assignments that may exist deeper in the instrument. 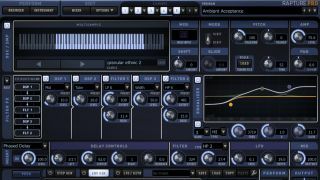 For example, most instruments, including Cakewalk's Z3ta+2 and Rapture Pro, offer a mod matrix that allows hundreds of sonic possibilities by connecting different components of the synthesizer together in potentially creative ways. A lot of these connections form the fabric of the sound and can be easily analysed. Most synths today have an arpeggiator built in. Using this section of the synth can be a great way to create unique signature sounds. Combining the arpeggiator with effects is a great sound design technique, too. The arpeggiator acts like a sequencer where holding one note triggers multiple instances of that note in a rhythmic fashion. By experimenting and adding delays, reverbs, modulation and filtering to these patches, many different sounds can be obtained.